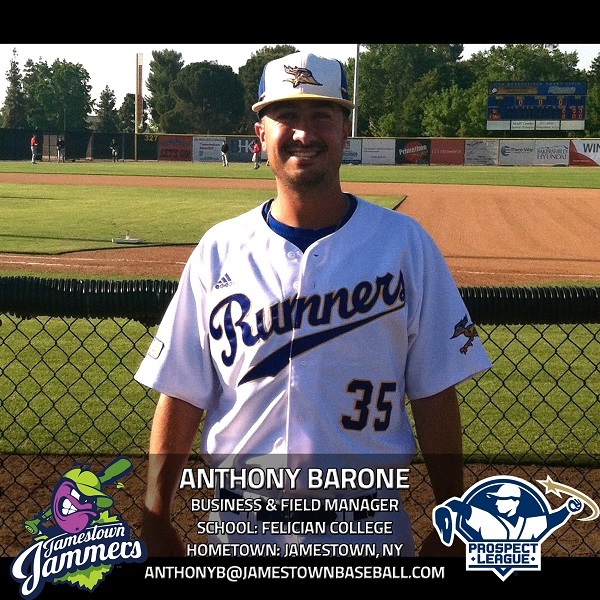 JAMESTOWN – MKE Sports & Entertainment is announcing the selection of Jamestown native Anthony Barone as Business Manager and Field Manager of the new Jamestown Jammers, which will begin play in the Prospect League in May 2015. Barone served as head coach of Jamestown (N.Y.) Community College from 2007 to 2012, where he led the Jayhawks to 207 victories and a 101-62 regional record. Barone was named National Junior College Athletic Association (NJCAA) Region 3 Coach of the Year in 2008 as Jamestown qualified for five consecutive NJCAA Regional Tournaments. From 2012 to 2014, Barone was an Assistant Coach at California State University – Bakersfield, where the team garnered a Western Athletic Conference Regular Season Championship. He has coached 8 players that are currently playing professional baseball. More information about the Jamestown Jammers, including game schedule and ticket prices, can be found online at JamestownBaseball.com.